Ambulatory cardiac monitoring is a way to watch and record the electrical activity of your heart. It is done as you go about your daily activities. Most of the recording devices are about the size of a cell phone. This test is used to determine whether the heart may be beating too slow or too fast. It also detects any abnormalities in heart rhythm. 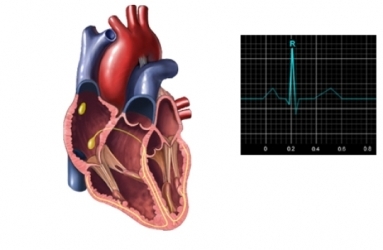 Your heartbeat is regulated by electrical impulses. Sometimes there are abnormalities with these impulses. When the abnormality is happening all the time, it is easy to find in the doctor's office. But sometimes the problem comes and goes. Ambulatory cardiac monitoring records your heart’s electrical activity for long periods of time. The length of time makes it much more likely to detect an abnormality that comes and goes. There are no major complications associated with this test. You will first be evaluated by a doctor. An electrocardiogram (EKG) checks the electrical activity of your heart. It will likely be done in the office. Holter monitoring —A small device will be strapped to you. Wires from the device will be attached to electrodes on your chest. Electrodes are small adhesive pads. You may be taught to replace them or asked not to remove them during the monitoring period. You will be instructed to keep a diary of your activities for the next 24-48 hours. You will then return the device and your diary for analysis. Some devices have an event button. You will push the button each time you have concerning symptoms. Looping monitor —The electrode may be a wrist band, finger attachment, or chest plate. This device records several minutes at a time, then starts over. You will push a button during or after an event to save the recording. For longer periods of monitoring, there is an implantable version. This electrode is surgically placed under your skin. Event recorder —This device is only used when you have symptoms. The device can be a wrist band with an activation button or a pager-sized device that you press onto your chest. Some of these are connected to a 24-hour-a-day central base that can immediately detect and respond to the event when you activate the signal. CardioNet (mobile cardiac outpatient telemetry) —A special service monitors your heartbeat continuously. It will respond immediately if it detects a serious event. Certain environmental interferences should be avoided, including: magnets, metal detectors, high-voltage wires, radio frequency signalers, microwave ovens, electric blankets, electric toothbrushes, and electric razors. After the procedure, you will return the equipment. A typical interval is 24 hours. If your problem is less frequent than that, you may need to be monitored for a longer period of time. Longer monitoring often requires different devices. This test will not hurt. Sometimes removing the electrodes can be uncomfortable. The information recorded by the monitor will be evaluated. Your doctor will let you know if you need any more tests or treatment based on the study. Call your doctor if you have trouble breathing, chest pain, or any other concerns. Abbott AV. Diagnostic Approach to Palpitations. Am Fam Physician. 2005;71(4):743-750. Ambulatory monitors. Cleveland Clinic Heart Center website. Available at: http://my.clevelandclinic.org/heart/services/tests/electrocard/ambmonitor.aspx. Updated September 2013. Accessed September 7, 2017. Kadish A, Buxton A, et al. ACC/AHA clinical competence statement on electrocardiography and ambulatory electrocardiography. J Am Coll Cardiol. 2001;38(7):2091-2100.